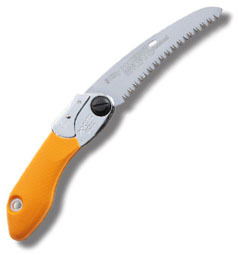 Silky's Bigboy multi-purpose folding saw provides a greater reach than a standard folding saw due to its 360mm blade and can be used for a wide range of pruning work and garden maintenance. The precision-ground, razor sharp blade has four cutting angles along the length of the saw and provides a fast, clean and smooth cutting action. 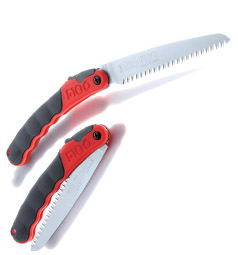 Long well-balanced taper-ground blades with impulse-hardened non-set tooth design provide extended working reach, faster cutting and handles large limbs and small trunks with little effort. The non-slip two-handed rubberized cushioned handle provides a sure and comfortable grip even in the most difficult operating conditions. 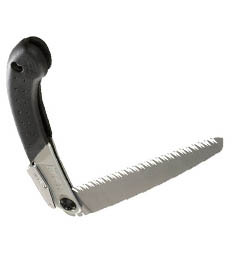 This is an ideal multi-purpose folding saw for cutting big jobs down to size. Utilizes proprietary Silky 'Mirai-Me' technology. The original Bigboy is available in 3 teeth sizes/configurations. Each Bigboy has a colour-coded handle associated with the teeth configuration. There is also a curved version, the Bigboy 2000 which is available as an 'Extra Large' teeth curved alternative. 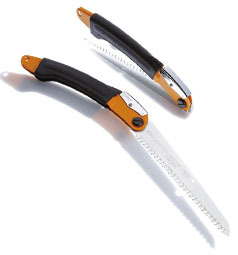 It is not possible to re-sharpen the blade but the saws are designed to have replaceable blades. Other parts are also available. There is just one screw to unwind in order to change the blade. 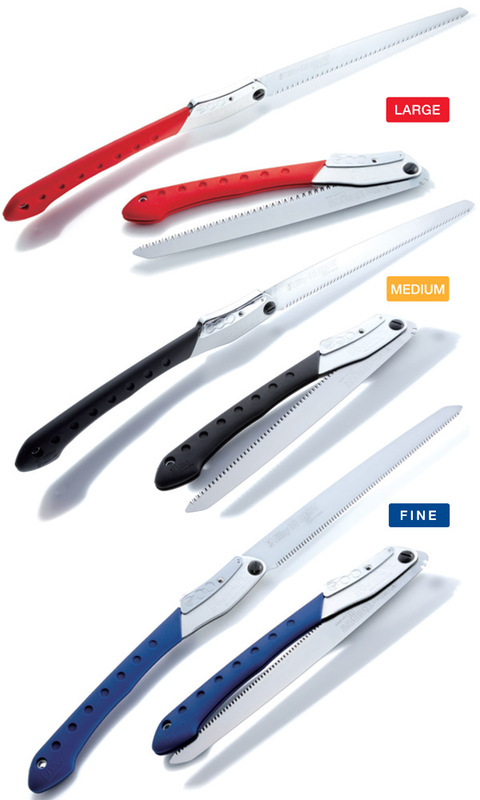 The saw should be stored in the closed position and cleaned of any debris/dirt to ensure a smooth opening operation. Ideally the blade should be cleaned with a solvent being careful to keep it away from the handle - this will help prolong its useful life. Store away from moisture. 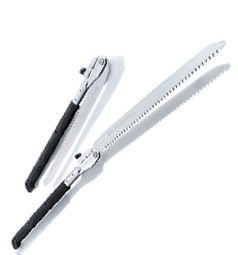 Silky Saws are manufactured from SK-4 carbon steel and cut out by a laser. The teeth are designed with no set which means they are formed inside the width of the blade - this reduces friction and enables a cleaner, faster and easier cut. Many other saws have teeth formed to project outside the width of the blade requiring much greater effort when sawing. There are 4 razor sharp cutting angles on the inside of each tooth. Silky call this 'Mirai-Me' and it enables the blade to cut smoothly through the branch, significantly reducing splintering and producing a very fine, smooth cut. The super fine cut destroys up to 50% less wood cells allowing the tree to heal faster and reduces the risk of disease. The manufacturing process also uses the technique of high-frequency electro-impulse hardening during which the teeth are heated and hardened. Importantly, only the teeth are hardened, not the rest of the blade. Thus the blade retains its original flexibility whilst the teeth have a life which is up to 3 times longer than that on standard saws. The blades are also chrome plated which helps protect against rust and sap as well as providing additional strength. This helps extend the life of the blade.